Slightly More Interesting are a Kent based artist duo who have recently launched a Kickstarter campaign for a new range of brightly coloured cat inspired cards. I was very pleased when not only did they agree to be interviewed but also created an exclusive Creatabot inspired cat design! We are Paul Flood and Matt Hayward and we have lived in Medway all our lives. We work pretty much exclusively from Matts bedroom/office. Why illustrations and why cat illustrations? We chose cats as we both have two cats each and when your bedroom is your office then the Cats are your colleagues. We were both huge fans of Garfield cartoons when we were children and so when thinking of creating a cat project, illustration seemed the obvious choice for us. Are you self taught creatives? We both went to KIAD when we came out of school but both continued on with self teaching after we had finished our courses. Matt specialised in digital design and I (Paul) worked primarily in ink. Through the process and other previous designs I have been learning the craft of digital design using Photoshop and Illustrator. Congratulations on reaching your Kickstarter target! Can we expect to see many new characters in the new year or will moggies stay the focus? We are already planning the future of our creation that will expand out into film/tv and video game homage designs staring out kitty creation. We would also love to do an extensive range of ethnic holiday themed cards also. The thought has crossed our mind to include other animals in the future but for now it will be centred, much as our lives are, around the cats. We have been recently infulenced by Matt Groening, Justin Roiland and Ralph Steadman and would love to do a few future designs showing more influence of other styles while still keeping the integrity of the cat character intact. Do you have a favourite type of music to listen to while creating? Our creativity has recently had the soundtrack of many a podcast such as Grandma’s Virginity, No such thing as a fish, Down the line and RHLSTP. What is your favourite place in Medway? For us, Rochester castle Gardens is the best place to spend a day sketching and coming up with new ideas along with intermittent rounds of frisbee. Thank you so much for talking to us and thank you so much for the amazing Creatabot Cat! 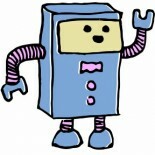 I think I will be ordering a batch of cards for Creatabot supporters! Please support Slightly More Interesting and back their Kickstarter by visiting www.kickstarter.com/projects/1337916852/cat-cards and making a pledge in return for some of their wonderful cards to call your own. This entry was posted on 25/11/2015 by Natasha Steer in Editorials, Featured Creatives.